Kevin Warwick was born during 1954 in Keresley, Coventry in the United Kingdom and attended Lawrence Sheriff School in Rugby, Warwickshire where he was a contemporary with Arthur Bostrom. He quit school during 1970 for an apprenticeship with British Telecom, at the age of 16. During 1976 he was granted his first degree at Aston University, followed by a PhD degree and a research job at Imperial College London. He had positions at Somerville College, Oxford, Newcastle University, University of Warwick and University of Reading before relocating to Coventry University during 2014. Warwick is a Chartered Engineer (CEng), a Fellow of the Institution of Engineering and Technology (FIET) and a Fellow of the City and Guilds of London Institute (FCGI). He is Visiting Professor at the Czech Technical University in Prague, the University of Strathclyde, Bournemouth University and the University of Reading and during 2004 was Senior Beckman Fellow at the University of Illinois at Urbana–Champaign, USA. He is also on the Advisory Boards of the Instinctive Computing Laboratory, Carnegie Mellon University and the Centre for Intermedia, University of Exeter. By the age of 40 he had been awarded a DSc degree, a higher doctorate, by both Imperial College and by the Czech Academy of Sciences, Prague for his research output in completely separate areas. He has received the IET Achievement Medal, the IET Mountbatten Medal and during 2011 the Ellison-Cliffe Medal from the Royal Society of Medicine. Warwick presented the Royal Institution Christmas Lectures, entitled The Rise of Robots in the year 2000. Warwick performs research in artificial intelligence, biomedical engineering, control systems and robotics. Much of Warwick's early research was in the area of discrete time adaptive control. He introduced the first state space based self-tuning controller and unified discrete time state space representations of ARMA models. However he has also contributed to mathematics, power engineering and manufacturing production machinery. Warwick directed an Engineering and Physical Sciences Research Council funded research project which investigated the use of machine learning and artificial intelligence techniques to suitably stimulate and translate patterns of electrical activity from living cultured neural networks to use the networks for the control of mobile robots. Hence a biological brain actually provided the behaviour process for each robot. Previously Warwick helped develop genetic algorithm named Gershwyn, which was able to exhibit creativity in producing popular songs, learning what makes a successful record by listening to examples of previous successful songs. Gershwyn appeared on BBC's Tomorrow's World having been successfully used to mix music for Manus, a group consisting of the four younger brothers of Elvis Costello. Another Warwick project involving artificial intelligence was the robot head, Morgui. The head contained 5 senses (vision, sound, infrared, ultrasound and radar) and was used to investigate sensor data fusion. The head was X-rated by the University of Reading Research and Ethics Committee due to its image storage capabilities – anyone under the age of 18 who wished to interact with the robot had to obtain parental approval. Warwick has very outspoken opinions about the future, particularly with respect to artificial intelligence and its effect on the human species, and argues that humanity will need to use technology to enhance itself to avoid being overtaken by machines. He states that many human limitations, such as sensorimotor abilities, can be outperformed by machines, and is on record as saying that he wants to gain these abilities: "There is no way I want to stay a mere human." Warwick directed the University of Reading team in a number of European Community projects such as FIDIS researching the future of identity, ETHICBOTS and RoboLaw which considered the ethical aspects of robots and cyborgs. Warwick’s topics of interest have many ethical implications, some due to his Human enhancement experiments. The ethical dilemmas of his research are used as a case study for schoolchildren and science teachers by the Institute of Physics as a part of their formal Advanced level and GCSE studies. His work has also been discussed by The President's Council on Bioethics and the President's Panel on Forward Engagements. He is a member of the Nuffield Council on Bioethics Working Party on Novel Neurotechnologies. Along with Tipu Aziz and his team at John Radcliffe Hospital, Oxford, and John Stein of the University of Oxford, Warwick is helping to design the next generation of deep brain stimulation for Parkinson's disease. Instead of stimulating the brain all the time, the goal is for the device to predict when stimulation is needed and to apply the signals prior to any tremors occurring to stop them before they even start. Recent results have also shown that it is possible to identify different types of Parkinson's Disease. Warwick has directed a number of projects intended to excite schoolchildren about the technology with which he is involved. During 2000 he received the Engineering and Physical Sciences Research Council Millennium Award for his Schools Robot League. During 2007, 16 school teams were involved in designing a humanoid robot to dance and then complete an assault course—- a final competition being performed at the Science Museum, London. The project, entitled 'Androids Advance' was funded by EPSRC and was presented as a news item by Chinese television. Warwick contributes significantly to the public understanding of science by giving regular public lectures, participating with radio programmes and by popular writing. He has appeared in numerous television documentary programmes on artificial intelligence, robotics and the role of science fiction in science, such as How William Shatner Changed the World, Future Fantastic and Explorations. He also appeared in the Ray Kurzweil inspired movie Transcendent Man along with William Shatner, Colin Powell, and Stevie Wonder. He has also guested on a number of television talk shows, including Late Night with Conan O'Brien, Først & sist, Sunday Brunch and Richard & Judy. Warwick has appeared on the cover of a number of magazines, for example the February 2000 edition of Wired. During 2005 Warwick was congratulated for his work in attracting students to science by members of Parliament in the United Kingdom in an Early day motion for making the subject interesting and relevant so that more students will want to develop a career in science. In 2013 Warwick appeared as a guest on BBC Radio 4's The Museum of Curiosity with Robert Llewellyn and Cleo Rocos. In 2014 he appeared on BBC Radio 4's Midweek with Libby Purves, Roger Bannister and Rachael Stirling. Warwick's claims that robots that can program themselves to avoid each other while operating in a group raise the issue of self-organisation. In particular, the works of Francisco Varela and Humberto Maturana, once purely speculative now have become immediately relevant with respect to synthetic intelligence. Cyborg-type systems need to be not only homeostatic (meaning that they are able to preserve stable internal conditions in various environments) but adaptive, if they are to survive. Testing the claims of Varela and Maturana via synthetic devices is the more serious concern in the discussion about Warwick and those involved in similar research. "Pulling the plug" on independent devices cannot be as simple as it appears, for if the device displays sufficient intelligence and assumes a diagnostic and prognostic stature, we may ultimately one day be forced to decide between what it could be telling us as counterintuitive (but correct) and our impulse to disconnect because of our limited and "intuitive" perceptions. The 1999 edition of the Guinness Book of Records recorded that Warwick performed the first robot learning experiment by Internet. One robot, with an artificial neural network brain in Reading, UK, learnt how to move around. It then taught, via the Internet, another robot in SUNY Buffalo New York State, USA, to behave the same way. The robot in the US was therefore not taught or programmed by a human, but rather by another robot based on what it itself had learnt. Hissing Sid was a robot cat which Warwick took on a British Council lecture tour of Russia, it being presented in lectures at such places as Moscow State University. Sid, which was put together as a student project, got its name from the noise made by the pneumatic actuators used to drive its legs when walking. The robot also appeared on BBC TV's Blue Peter but became better known when it was refused a ticket by British Airways on the grounds that they did not allow animals in the cabin. Warwick was also responsible for a robotic "magic chair" (based on the SCARA-form UMI RTX arm) which Sir Jimmy Savile used on BBC TV's Jim'll Fix It. The chair provided Jim with tea and stored Jim'll Fix It badges for him to hand out to guests. Warwick appeared on the programme himself for a Fix it involving robots. Warwick was also involved in the development of the "seven dwarves" robots, a version of which was sold in kit form as "Cybot" on the cover of Real Robots magazine. Probably the most famous research undertaken by Warwick (and the origin of the nickname, "Captain Cyborg", given to him by The Register) is the set of experiments known as Project Cyborg, in which he had an array implanted into his arm, with the goal of "becoming a cyborg". The first stage of this research, which began on 24 August 1998, involved a simple RFID transmitter being implanted beneath Warwick's skin, which was used to control doors, lights, heaters, and other computer-controlled devices based on his proximity. The main purpose of this experiment was said to be to test the limits of what the body would accept, and how easy it would be to receive a meaningful signal from the microprocessor. The second stage involved a more complex neural interface which was designed and built especially for the experiment by Dr. Mark Gasson and his team at the University of Reading. This device consisted of a BrainGate electrode array, connected to an external "gauntlet" that housed supporting electronics. It was implanted on 14 March 2002, in the Radcliffe Infirmary and was interfaced directly into Warwick's nervous system. The electrode array inserted contained 100 electrodes, of which 25 could be accessed at any one time, whereas the median nerve which it monitored carries many times that number of signals. The experiment proved successful, and the signal produced was detailed enough that a robot arm developed by Warwick's colleague, Dr Peter Kyberd, was able to mimic the actions of Warwick's own arm. A highly publicised extension to the experiment, in which a simpler array was implanted into the arm of Warwick's wife with the ultimate aim of one day creating a form of telepathy or empathy using the Internet to communicate the signal from afar—was also successful insofar as it resulted in the first direct and purely electronic communication between the nervous systems of two humans. Finally, the effect of the implant on Warwick's hand function was measured using the University of Southampton Hand Assessment Procedure (SHAP). It was feared that directly interfacing with the nervous system might cause some form of damage or interference, but no measurable effect nor rejection was found. Indeed, nerve tissue grew around the electrode array, enclosing the sensor. Warwick and his colleagues claim that the Project Cyborg research could result in new medical tools for treating patients with damage to the nervous system, as well as assisting the more ambitious enhancements Warwick advocates. Some transhumanists even speculate that similar technologies could be used for technology-facilitated telepathy. A controversy began during August 2002, shortly after the Soham murders, when Warwick reportedly offered to implant a tracking device into an 11-year-old girl as an anti-abduction measure. The plan produced a mixed reaction, with endorsement from many worried parents but ethical concerns from children's societies. As a result, the idea did not go ahead. Anti-theft RFID chips are common in jewellery or clothing in some Latin American countries due to a high abduction rate, and the company VeriChip announced plans during 2001 to expand its line of available medical information implants, to be GPS trackable when combined with a separate GPS device. Warwick participated as a Turing Interrogator, on two occasions, judging machines in the 2001 and 2006 Loebner Prize competitions, platforms for an 'imitation game' as devised by Alan Turing. The 2001 Prize, held at the Science Museum in London, featured Turing's 'jury service' or one-to-one Turing tests and was won by A.L.I.C.E. The 2006 contest staged parallel-paired Turing tests at University College London and was won by Rollo Carpenter. He co-organised the 2008 Loebner Prize at the University of Reading; a report on the contest's 'theatre of two Turing tests' can be found here. During 2012 he co-organized, with Huma Shah, a series of Turing tests held at Bletchley Park. The tests strictly adhered to the statements made by Alan Turing in his papers, according to Warwick. Warwick himself participated with the tests as a hidden human. Results of the tests were discussed in a number of academic papers. One paper, entitled “Human Misidentification in Turing Tests”, became one of the top 3 most downloaded papers in the Journal of Experimental and Theoretical Artificial Intelligence. During June 2014 Warwick helped Shah stage a series of Turing tests to mark the 60th anniversary of Alan Turing's death. The event was performed at the Royal Society, London. Warwick regarded the winning chatbot, "Eugene Goostman", as having "passed the Turing test for the first time" by fooling a third of the event's judges into not making the right identification, and termed this a "milestone". A paper including all of the transcripts involving Eugene Goostman entitled "Can Machines Think? A Report on Turing Test Experiments at the Royal Society", has also become one of the top 3 most downloaded papers in the Journal of Experimental and Theoretical Artificial Intelligence. Warwick was criticized in association with the Turing tests performed during 2014 at the Royal Society, where he claimed that software program Eugene Goostman had passed the Turing test on the basis of its performance. The software successfully convinced over 30% of judges who could not identify it as being a machine, on the basis of a five-minute text chat. Critics stated that the software's claim to be a young non-native speaker weakened the spirit of the test, as any grammatical and semantic inconsistencies could be excused as a consequence of limited English proficiency. Some critics also claimed that the software's performance had been exceeded by other programs in the past. However the 2014 tests were completely unrestricted in terms of topics of discussion whereas the previous tests referred to by the critics had very restricted/specific subject areas. Additionally, Warwick was criticized by editor and entrepreneur Mike Masnick for exaggerating its significance to the press. Warwick was a member of the 2001 Higher Education Funding Council for England (unit 29) Research Assessment Exercise panel on Electrical and Electronic Engineering and was Deputy chairman for the same panel (unit 24) during 2008. During March 2009, he was cited as being the inspiration of National Young Scientist of the Year, Peter Hatfield. When Warwick presented the Royal Institution Christmas Lectures entitled The Rise of Robots in the year 2000, the lectures were well received by some. However, in a letter Simon Colton complained about the choice of Warwick, prior to his appearance. He claimed that Warwick is not a spokesman for our subject (Artificial Intelligence) and allowing him influence through the Christmas lectures is a danger to the public perception of science. Due to Warwick's claims that computers could be creative, Colton, who is a Reader in Computational Creativity, also said the AI community has done real science to reclaim words such as creativity and emotion which they claim computers will never have. Subsequent letters were generally positive; Ralph Rayner wrote With my youngest son, I attended all of the lectures and found them balanced and thought-provoking. They were not sensationalist. I applaud Warwick for his lectures. Warwick was presented with The Future of Health Technology Award and during 2004 received The Institution of Electrical Engineers (IEE) Achievement Medal. During 2008 he was awarded the Mountbatten Medal. In 2009 he received the Marcellin Champagnat award from Universidad Marista Guadalajara and the Golden Eurydice Award. In 2011 he received the Ellison-Cliffe Medal from the Royal Society of Medicine. During 2014 he was elected to the membership of the European Academy of Sciences and Arts. In 2018 Warwick was inducted into the International Academy for Systems and Cybernetic Sciences. He has received Honorary Doctorates from Aston University, Coventry University, Robert Gordon University, Bradford University, University of Bedfordshire, Portsmouth University, Kingston University, Ss. Cyril and Methodius University of Skopje and Edinburgh Napier University. Warwick has both his critics and endorsers, some of whom describe him as a "maverick", whereas others see his work as "not very scientific" and more like "entertainment". Conversely some regard him as "an extraordinarily creative experimenter", his presentations as "awesome" and his work as "profound". Kevin Warwick (2001). QI: The Quest for Intelligence. Piatkus Books. ISBN 978-0-7499-2230-6. Kevin Warwick (2004). I, Cyborg. University of Illinois Press. ISBN 978-0-252-07215-4. Kevin Warwick (2004). March of the Machines: The Breakthrough in Artificial Intelligence. University of Illinois Press. ISBN 978-0-252-07223-9. Kevin Warwick (30 August 2011). Artificial Intelligence: The Basics. Taylor & Francis. ISBN 978-0-415-56483-0. Retrieved 23 April 2011. Kevin Warwick and Huma Shah (2016). Turing's Imitation Game. Cambridge University Press. ISBN 978-1-107-05638-1. 1998, Robert Boyle Lecture at the University of Oxford. 2000, Royal Institution Christmas Lectures. These lectures were repeated during 2001 in a tour of Japan, China and Korea. 2001, Higginson Lecture at Durham University, Hamilton institute inaugural lecture. 2004, Woolmer Lecture of the Institute of Physics and Engineering in Medicine at University of York; Robert Hooke Lecture (Westminster). 2006, Bernard Price Memorial Lecture tour in South Africa; Institution of Mechanical Engineers Prestige Lecture in London. 2007, Techfest plenary lecture in Mumbai; Kshitij keynote in Kharagpur (India); Engineer Techfest plenary lecture in NITK Surathkal (India); Annual Science Faculty lecture at University of Leicester; Graduate School in Physical Sciences and Engineering Annual Lecture, Cardiff University. 2008, Leslie Oliver Oration at Queen's Hospital; Techkriti keynote in Kanpur. 2008, Katholieke Universiteit Leuven, guest lecture "Four weddings and a Funeral" for the Microsoft Research Chair. 2009, Cardiff University, 125th Anniversary Lecture; Orwell Society, Eton College. 2011, Ellison-Cliffe Lecture, Royal Society of Medicine; Inaugural research conference keynote, Anglia Ruskin University. 2012, IET Pinkerton Lecture, Bangalore. ; Institute of Electrical and Electronics Engineers UKRI 50 years Anniversary Lecture, Edinburgh. 2014, Sir Hugh Cairns Memorial Lecture, Society of British Neurological Surgeons, London. ; Invited Keynote, BCS-SGAI International Conference on Artificial Intelligence, Cambridge University. 2016, Launch of Wales Festival of Innovation, Cardiff. 2017, Paul B. Baltes Lecture, Berlin-Brandenburg Academy of Sciences and Humanities. Warwick is a regular presenter at the annual Careers Scotland Space School, University of Strathclyde. ^ New Deputy Vice-Chancellor for Research at Coventr. Coventry.ac.uk. Retrieved on 14 May 2016. ^ Delgado, A.; Kambhampati, C.; Warwick, K. (1995). "Dynamic recurrent neural network for system identification and control". IEE Proceedings – Control Theory and Applications. 142 (4): 307. doi:10.1049/ip-cta:19951873. ^ Zhu, Q. M.; Warwick, K.; Douce, J. L. (1991). "Adaptive general predictive controller for nonlinear systems". IEE Proceedings D Control Theory and Applications. 138: 33. doi:10.1049/ip-d.1991.0005. ^ "Ambient Intelligence Lab (AIL) – Ambient Intelligence". Cmu.edu. Retrieved 26 September 2009. ^ Advisory Board – English – University of Exeter. Humanities.exeter.ac.uk. Retrieved 23 April 2011. ^ "The Pinkerton Lecture 2012". The Institution of Engineering and Technology. Retrieved 24 October 2012. ^ Warwick, K. (1981). "Self-tuning regulators—a state space approach". International Journal of Control. 33 (5): 839. doi:10.1080/00207178108922958. ^ Warwick, K. (1990). "Relationship between åström control and the kalman linear regulator—caines revisited". Optimal Control Applications and Methods. 11 (3): 223. doi:10.1002/oca.4660110304. ^ Warwick, K. (1983). "Using the Cayley-Hamilton theorem with N-partitioned matrices". IEEE Transactions on Automatic Control. 28 (12): 1127. doi:10.1109/TAC.1983.1103193. ^ "Rise of the rat-brained robots – tech – 13 August 2008". New Scientist. Retrieved 26 September 2009. ^ Radford, Tim (13 July 2003). "University robot ruled too scary". The Guardian. London. ^ "Kevin Warwick, Professor of Cybernetics". BBC News. ^ Warwick, K. (2010). "Implications and consequences of robots with biological brains". Ethics and Information Technology. 12 (3): 223. doi:10.1007/s10676-010-9218-6. ^ Human Enhancement-The way ahead. Ubiquity.acm.org (15 March 2012). Retrieved on 2016-05-14. ^ PEEP Physics Ethics Education Project: People. Peep.ac.uk. Retrieved on 14 May 2016. ^ "Neurotechnology – About the Working Party | Nuffield Council on Bioethics". Nuffieldbioethics.org. Archived from the original on 13 June 2013. Retrieved 26 May 2013. ^ HuntGrubbe, Charlotte (22 July 2007). "The blade runner generation". The Times. London. Retrieved 7 May 2010. ^ Wu, D; Warwick, K; Ma, Z; Gasson, M. N.; Burgess, J. G.; Pan, S; Aziz, T. Z. (2010). "Prediction of Parkinson's disease tremor onset using a radial basis function neural network based on particle swarm optimization". International Journal of Neural Systems. 20 (2): 109–16. doi:10.1142/S0129065710002292. PMID 20411594. ^ Cámara, C, Isasi, P, Warwick, K, Ruiz, V, Aziz, T, Stein, J and Bakštein, E: "Resting Tremor Classification and Detection in Parkinson's Disease Patients", Biomedical Signal Processing and Control, Vol.16, pp.88–97, February 2015. ^ "Cover Browser". Wired. Archived from the original on 16 March 2014. ^ Housing Revenue Account Subsidy Scheme And Wales. Edms.org.uk (4 November 2010). Retrieved 23 April 2011. ^ "BBC Radio 4 - the Museum of Curiosity, Series 6, Llewellyn, Rocos, Warwick". ^ "BBC Radio 4 - Midweek, Sir Roger Bannister, Prof Kevin Warwick, Rachael Stirling, Diana Darke". ^ "-BA criticised over denying boarding to robotic cat". Airline Industry Information. 22 October 1999. Archived from the original on 16 October 2015. ^ UMI. "Inside the UMI RTX Robot Arm" (PDF). Retrieved 23 October 2012. ^ Delaney, Sam (31 March 2007). "Now then, now then". The Guardian. London. Retrieved 7 May 2010. ^ a b Warwick, K.; Gasson, M.; Hutt, B.; Goodhew, I.; Kyberd, P.; Andrews, B.; Teddy, P.; Shad, A. (2003). "The Application of Implant Technology for Cybernetic Systems". Archives of Neurology. 60 (10): 1369–73. doi:10.1001/archneur.60.10.1369. PMID 14568806. ^ "Professor has world's first silicon chip implant". 25 August 1998. ^ Wired Magazine 8.02 (February 2000), 'Cyborg 1.0: Interview with Kevin Warwick'. Retrieved 25 December 2006. ^ Warwick, K.; Gasson, M.; Hutt, B.; Goodhew, I.; Kyberd, P.; Schulzrinne, H.; Wu, X. (2004). "Thought Communication and Control: A First Step using Radiotelegraphy". IEE Proceedings on Communications. 151 (3): 185. doi:10.1049/ip-com:20040409. ^ Kyberd, P. J.; Murgia, A.; Gasson, M.; Tjerks, T.; Metcalf, C.; Chappell, P. H.; Warwick, K.; Lawson, S. E. M.; Barnhill, T. (2009). "Case studies to demonstrate the range of applications of the Southampton Hand Assessment Procedure". British Journal of Occupational Therapy. 72 (5): 212. doi:10.1177/030802260907200506. ^ Gasson, M.; Hutt, B.; Goodhew, I.; Kyberd, P.; Warwick, K. (2005). "Invasive neural prosthesis for neural signal detection and nerve stimulation". International Journal of Adaptive Control and Signal Processing. 19 (5): 365–375. doi:10.1002/acs.854. ^ Dvorsky, George (26 April 2004). "Evolving Towards Telepathy". Betterhumans. Archived from the original on 6 July 2007. ^ Weissert, Will (15 July 2004). "Mexico implants microchips for ID". Arizona Daily Star. Archived from the original on 13 August 2004. Retrieved 31 January 2015. ^ VeriChip. "Implantable Verification Solution for SE Asia". Inforlexus. Archived from the original on 31 December 2006. ^ Scheeres, Julia (25 January 2002). "Kidnapped? GPS to the Rescue". Wired News. Archived from the original on 28 August 2008. ^ Scheeres, Julia (15 February 2002). "Politician Wants to 'Get Chipped'". Wired News. Archived from the original on 24 July 2008. ^ "Can a machine think? – results from the 18th Loebner Prize contest – University of Reading". Rdg.ac.uk. Retrieved 26 September 2009. ^ Warwick, K; Shah, H (2014). "Good Machine Performance in Turing's Imitation Game". IEEE Trans. On Computational Intelligence and AI in Games. 6 (3): 289. doi:10.1109/TCIAIG.2013.2283538. ^ Warwick, K; Shah, H (2014). "Effects of Lying in Practical Turing Tests". AI & Society. 31: 5–15. doi:10.1007/s00146-013-0534-3. ^ "Turing Test success marks milestone in computing history". University of Reading. 8 June 2014. Retrieved 8 June 2014. ^ a b c No, A 'Supercomputer' Did NOT Pass The Turing Test For The First Time And Everyone Should Know Better. Techdirt (9 June 2014). Retrieved on 2016-05-14. ^ "Today: Friday 6 March 2009". BBC News. 6 March 2009. ^ Cyber don shrugs off attack on credibility. Timeshighereducation.co.uk (5 May 2016). Retrieved on 2016-05-14. ^ "AISB – Cyborg Off His Christmas Tree by Simon Colton". Doc.ic.ac.uk. 22 December 2001. Retrieved 26 May 2013. ^ "Letter: A Christmas cheer | General". Times Higher Education. 12 January 2001. Retrieved 26 May 2013. ^ IET Awards – IET Conferences. Conferences.theiet.org. Retrieved on 14 May 2016. ^ "University Professor scoops top technology award". Media-Newswire.com. 20 November 2008. Retrieved 26 September 2009. ^ ICTthatmakesthedifference.eu. ICTthatmakesthedifference.eu. Retrieved 23 April 2011. ^ "The Royal Society of Medicine > Courses > Ellison-Cliffe Lecture". Rsm.ac.uk. 11 October 2011. Archived from the original on 18 May 2013. Retrieved 26 May 2013. ^ European Academy of Sciences and Arts. Euro-acad.eu. Retrieved on 14 May 2016. ^ "The International Academy for Systems and Cybernetics Sciences IASCYS". ^ High profile graduates celebrated by Aston University. Aston.ac.uk. Retrieved on 14 May 2016. ^ a b "Achievements". Kevinwarwick.com. 30 December 2000. Archived from the original on 29 June 2013. Retrieved 26 May 2013. ^ "World's First Cyborg Honoured by University | July 11". Rgu.ac.uk. 27 July 2011. Archived from the original on 19 September 2012. Retrieved 26 May 2013. ^ "Honorary degree number four for Professor of Cybernetics – University of Reading". Reading.ac.uk. 2 August 2011. Retrieved 26 May 2013. ^ Professor Kevin Warwick discusses his honorary degree A.I. and singularity on YouTube (22 July 2010). Retrieved 23 April 2011. ^ "Honorary graduates announced | UoP News". Port.ac.uk. Retrieved 26 May 2013. ^ Professor Kevin Warwick receives honorary DSc by Kingston University – University of Reading. Reading.ac.uk (6 February 2014). Retrieved on 2016-05-14. ^ Cyberneticist Kevin Warwick an Honorary Ss. Cyril and Methodius PhD. Independent.mk (22 May 2015). Retrieved on 2016-05-14. ^ 'Cyborg' professor honoured. Irish Examiner (6 July 2015). Retrieved on 2016-05-14. ^ Hamill, Sean (19 September 2010). "Professor's self-experiments in cybernetics have provoked debate in the field". Pittsburgh Post-Gazette. Retrieved 11 June 2014. ^ Edgar, James (10 June 2014). "'Captain Cyborg': the man behind the controversial Turing Test claims". The Daily Telegraph. Retrieved 11 June 2014. ^ Jonker, C. and Nelis, A. (2013) "Human Robots and Robotic Humans", Chapter 7 in Engineering the Human, B-J. Koops, C. Luthy, A. Nelis, C. Sieburgh, J. Jansen and M. Schmid (eds. ), Springer-Verlag, Berlin Heidelberg, p. 85. ^ "Inaugural Leslie Oliver Oration". BHR University Hospitals. Retrieved 26 September 2009. ^ "Events". Kevinwarwick.com. Archived from the original on 6 June 2011. Retrieved 26 September 2009. ^ Launch of IDEAS|10 May|Robert Gordon University Events. Rgu.ac.uk (13 May 2010). Retrieved 23 April 2011. ^ "November 2011 – Bulletin Vol 8 No 10". Issuu.com. 20 October 2011. Retrieved 26 May 2013. ^ "The Pinkerton lecture – IET Conferences". Theiet.org. Retrieved 26 May 2013. ^ "Celebrating 50 Years of IEEE serving the engineering community in the United Kingdom and Ireland". July 2012. Archived from the original on 15 April 2013. Retrieved 25 September 2012. ^ SGAI International Conference on Artificial Intelligence AI-2014. Bcs-sgai.org (11 December 2014). Retrieved on 2016-05-14. ^ "Event | Wales Festival of Innovation". ^ "Neural Implants for Therapy and Enhancement — Berlin-Brandenburgische Akademie der Wissenschaften". ^ "Battlestar Galactica Cyborgs on the Horizon". World Science Festival. 12 June 2009. Retrieved 26 September 2009. 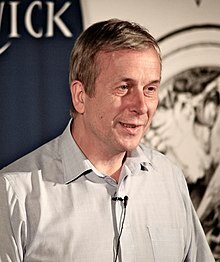 Wikimedia Commons has media related to Kevin Warwick.